Food security is defined as physical and economic access to food for all people at all times (Hoskins, 1990). Food security is therefore primarily concerned with food availability; and lack of food security ultimately reflects on the nutritional status of individuals. However, although the nutritional well-being of an individual is primarily determined by food availability, food security is influenced by a range of factors other than food availability, including economic and social status, health (physical/spiritual/mental), education and cultural biases (see Box 1). In looking at the role of wildlife in food security in Africa. we are concerned not only with the direct contribution of wildlife as a food resource, but also with the influence of wildlife on access to food through employment and income generation, its influence on physical, spiritual and cultural well-being of people. as well as its positive and negative influences on food production capabilities (see Box 2). To achieve food security under the current food situation and nutritional problems in Africa, a holistic and integrated approach to agricultural development is crucial. One path to solving the food security problem is to broaden the spectrum of crops cultivated and animals husbanded on the continent to include non-traditional species such as wildlife, and to develop new and innovative production systems to complement the conventional systems. The concept of food security used in its most general form essentially means a state of affairs where all people at all times: have access to safe and nutritious food so as to maintain a healthy and active:: life. This: is the definition endorsed by a number of authorities (see em, FAO/WHO, 1992; USAID, 1992; Petit and Gnaegy, 1994). FAO) has operationalized the Concept within its mandate: by stressing those aspects of the phenomenon that are related to the availability and stability of food: supplies at the national level,: through both time and space and access to food supplies at the household: and individual, as well as national level. The latter considerations are expressed in the definition of household food security accepted by the Committee on World Food Security as "physical and economic access to adequate food for all household members without undue risk of losing such access." Although the Consequences of food insecurity flare reflected ultimately on the individuals nutritional status, it must be born in mind that the nutritional status of an individual is: also influenced by processes that determine the allocation of: food within the household, its intake by the individual: end its subsequent physiological utilisation. In other words, health, 'sanitary, educational, economic, social, gender and cultural factors all play a part in influencing what is essentially the nutritional well-being of the individual. Ideally? Therefore? measures of food security should contain information having a bearing on the nutritional status of individuals, while somehow controlling for the effects of other factors that may also influence nutritional status. Traditionally, information on the: availability of food at some aggregate level and on the structure of its distribution among households has been used for measuring and monitoring the status of food security. Despite problems related to their accuracy, national food balance sheets and nutritional and/for consumption surveys are the most readily available sources for such in formation. In fact, FAO estimates* of the prevalence of under-nutrition in developing countries and of the Aggregate Household Food Security lndex (AHFSI) which are essentially based on them, make direct use of such data (FAO 1992). In these food security measurements, the most important component of these measurements are the annual estimates of per caput food availability in terms of caIories, from both domestic production and net imports (including food aid), obtained from national food balance sheets (FAO 1993). *The estimates reflect the number of chronically undernourished, who, on average in the course of a year, have food intake below that required to maintain body weight and support light activity. The threshold level is assumed to be equal to 1.54 times the Basal Metabolic Rate (BMR). 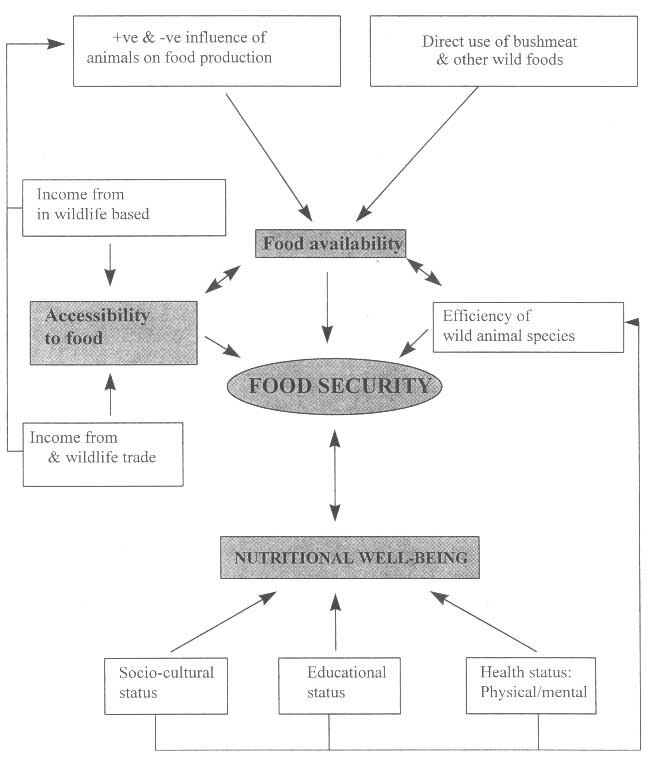 Box 2 FACTORS RELATED TO FOOD SECURITY AND THE POTENTIAL CONTRIBUTION FROM WILDLIFE RESOURCES. The need to develop the value of African wildlife was recognised as far back as the 1950s and 1960s. The development of wildlife as a natural resource in Africa featured on the agenda of meetings of the World Conservation Union (IUCN) at Athens in 1958, at Warsaw in 196O, at Arusha in 1961 and at Nairobi in 1963; and a decision to incorporate wildlife conservation in the United Nations Food and Agriculture Organisation's regular activities was taken in 1959 (Riney 1964, 1970). Unfortunately, despite all these concerns, very little investment and research effort have gone into the development of wildlife as a food resource as compared with inputs into conventional agriculture. Bushmeat was one of main sources of food and virtually the sole source of animal protein far people in pre-historic times. Civilisation and agricultural development over millennia has drastically reduced people's dependence on bushmeat as a source of food in many parts of the world. In Africa, however, bushmeat continues to contribute substantially to the total animal protein supply. In countries such as Botswana and Zaire, much of the meat consumed is bushmeat and in the majority of West African states, bushmeat is the preferred meat and has a higher retail value than domestic meat in urban markets. In addition to being a highly preferred food item in many areas of Africa, wild animal foods are life-saving reserves in times of food shortage and hunger. The importance of caterpillars, beetles and termites as key sources of food in times of famine is particularly well documented for communities in the Central African sub-region (see e.g. Wilson, 1990; McGregor, 1991; Takeda & Sato, 1993). Wildlife also contributes significantly to household incomes in both rural and urban communities through hunting, crafts and trade based on wildlife products; and to national economies through tourism and sale of wild animal products. "Wildlife", as used in this work is defined in the narrow sense to mean "wild animals" and includes both invertebrate and vertebrate animals, but excludes fish (which is being covered under a separate exercise commissioned by FAO to look at the role fisheries in food security); reference is made to fish in this work only where it is necessary to illustrate a point. Traditionally, "game" is used to refer to large mammals hunted for food, trophy or sport. In Africa, all species of wild animals, ranging from insects through reptiles, rodents to large mammals, are acceptable as a food resource. Therefore the word "Bushmeat" (which originated from West Africa and refers to meat of wild animals) is used in this work to refer to wild animals hunted/collected for food, while "game" is used in reference to animals hunted for sport or trophy. The work covers sub-Saharan Africa but excludes Madagascar and other islands geographically associated with Africa. In chapters 2 and 3 of the document. we present data and evidence to illustrate the direct and indirect contribution of wildlife to food security in Africa through wildlife use as a food resource and as a source of income and other human needs (see Box 3?. In chapter 4. the present wildlife production systems are examined; and finally in chapter 5 we argue the case for more investment and long term commitment from African governments and multilateral aid agencies to the development of Africa's wildlife resources to complement conventional agricultural production.